Tools like Buffer & Hootsuite were a great way to share. Yesterday. Today, they're leaving traffic and leads on the table. Try a new generation of social sharing that schedules, tracks and learns for you - driving better results and freeing your time for more important things. Import content to your Spokal library from RSS, Twitter, Feedly, or hand-craft some. Set up timeslots to tell Spokal when and how often you want to publish. Set up ratios, limits, and categories to have as much or as little control as you want. Or use our default settings which are a great place to start. ... as Spokal learns what your audience engages with most and schedules high-performing content from your library more frequently, driving more traffic to your site. Add more content when you want to, not because you need to 'feed your queue' every week. This is really awesome. I've been playing with Spokal Social for a couple of days + I love it. You've completely converted me! This is a lot quicker than Hootsuite! Instead of finding and scheduling new curated content every week, curate only the best of the best and add it to your library. Spokal will automatically schedule posts from there. 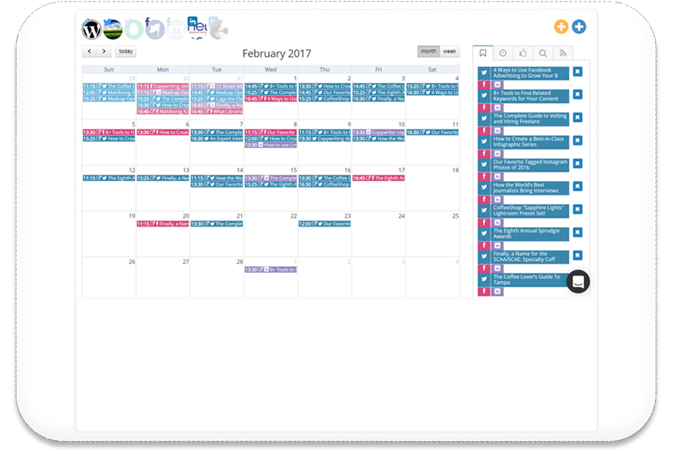 Spokal will fill empty slots with the best content from your library, freeing you up from the busy-work of scheduling content every week. It will continue to post for you even when you get busy or go on holiday. You put a lot of work into your content. Make sure it gets seen. Spokal will continue to schedule in old blog posts intermittently for as long as they're generating results. See everything at a glance. No more guesswork, spreadsheets or question marks. Drag and drop to schedule new posts or move them around. Use Spokal free for 14 days - it's on us. LOOKING FOR THE FULL WORDPRESS INBOUND MARKETING SOLUTION INSTEAD? All the Social Media tools plus: ROI calcs, automatic SEO cross-linking and analysis, lead scoring, A/B testing and more, with full integration with your existing WordPress site.